You may think that your pet is protected from getting lost. But accidents happen, and some things - like hurricanes and other natural disasters - are out of your control. In fact, one in three pets will become lost during their lifetime. And according to the American Humane Association, only about 17 percent of lost dogs and two percent of lost cats ever find their way back to their original owners. Almost 4 million pets are euthanized every year because their owners can't be found in time - if a shelter cannot determine a pet's owner, the pet may be euthanized in as few as three days. To help give your pet the best chance of being identified should he ever become lost, have him implanted with the HomeAgain microchip. Tags and collars are a good start - they're certainly better than no ID at all - but they aren't 100 percent dependable. Tags can fade, rust, or get scratched, making them impossible to read. Collars can tear or slip off, or get caught on something while your pet is wandering. With the HomeAgain microchip, on the other hand, your pet's source of identification is always available. To microchip your pet, a veterinarian injects a tiny chip about the size of a grain of rice just under your pet's skin between the shoulder blades. The number on the chip is then entered into the HomeAgain database. When a lost pet is found, any animal hospital, shelter, or humane society can use a special handheld microchip scanner to read our microchip's unique ID number. The veterinarian or shelter then contacts the HomeAgain database. The database matches the number to a name and phone number, reuniting the lost pet with its owner. HomeAgain. Always looking out for your pet. Proactive Pet Recovery helps you look for your pet. 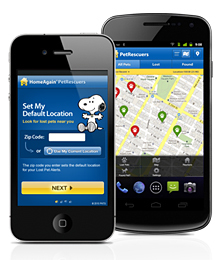 HomeAgain sends out lost pet alerts to veterinarians, shelters, and Pet Rescuers surrounding the area in which your pet was lost. 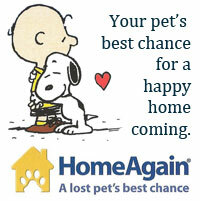 Medical Insurance for Lost Pets is now available with your annual HomeAgain membership. Offered by PetFirst Healthcare, it covers up to $3,000 (less a $50 deductible) of medical treatment for injuries your pet suffers while lost, upon proof of a lost pet incident. Coverage is not automatic - once enrolled in HomeAgain, call PetFirst to activate your pet's Lost Pet Medical Insurance coverage. Think your pet won't get lost? One in three will. Be prepared with the HomeAgain microchip. 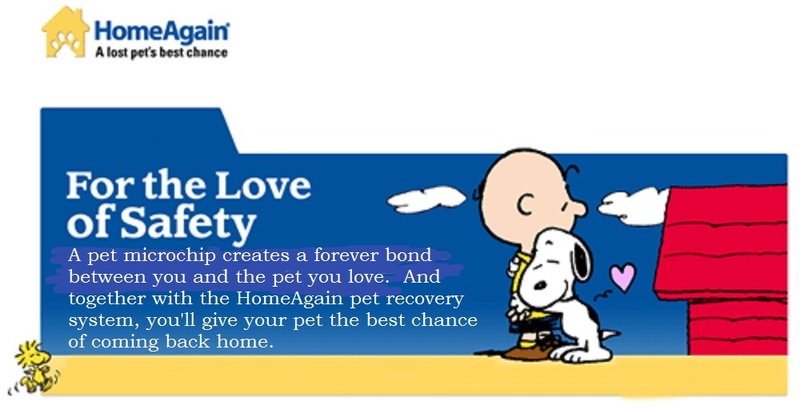 To date, HomeAgain is responsible for reuniting more than 400,000 pets with their owners. We can insert a microchip into your dog or cat at any time. Anesthesia is not needed The total cost is $32 including registration and all the extras. The microchip is for life and so is registration. Most of the other services such as paying for ads and pictures in local papers, insurance, etc are covered for the first year... after that there's an optional $15 yearly fee. The number one cause of pet death is from being lost. Hundreds of pets are euthanized at our county shelter EACH MONTH. Many others get hit by cars, die of injuries, illness, and starvation. Some are luckier and get taken in by nice people. Others get taken in by not so nice people. Please get your pet microchipped using the best microchip in the business. Rabies tags: besides being required by state law, if your lost pet has a rabies tag and collar, it's easy to track you down. The only problem is that a lot of pets, especially cats don't wear a collar or tag and they can get lost or removed. Another minor problem is that people have to wait until business hours to find out who the pet belongs too. Custom ID tags with your phone number on it: These are nice and we have an ID engraving machine at our office, if you'd like to buy one from us. Grooming: A well cared for pet lets everyone know that it's a loved pet and they are more likely to make an effort to find an owner. Tattoos: These are good for proving a pet is yours but not very effective at finding them in the first place. And it's hard to find a pet tattoo artist.